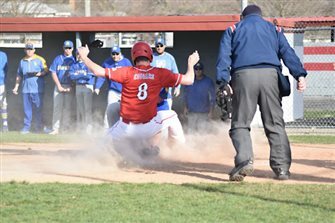 VAN WERT — Van Wert baseball has been playing excellent baseball this season but have really found their stride over the last few weeks. 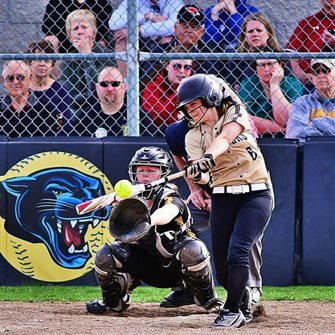 Since a pair of setbacks to state respected programs in Defiance and Fairview the Cougars have been on a streak outscoring their opponents 32-1 over the past three games. CONVOY — Baseball, and practically all sport, can be often be determined by who makes the least amount of mistakes. 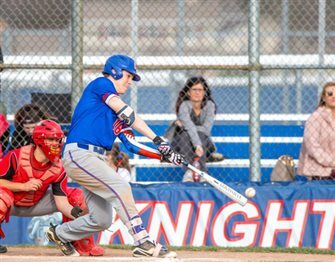 Well Tuesday, was weird, as the both Crestview and Jefferson made the exact same mistakes, but the Knights were able to capitalize more. Crestview won the NWC matchup 4-2. 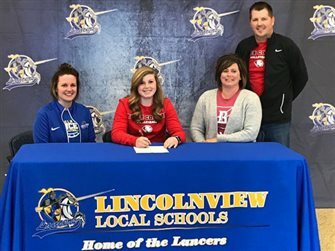 MIDDLE POINT — Bluffton and Lincolnview met Tuesday in a well-played battle for NWC softball leadership. In the end, the Lady Pirates’ junior pitcher Libby Schaadt was the decider, limiting the Lady Lancers to no runs and three hits in a 6-0 Bluffton win. The Pirates are now 13-1 overall and 4-0 in the NWC. Lincolnview is 10-4 and 2-1. OTTAWA — If you were wondering how the Cougs scored 15 runs on just 10 hits Tuesday, the answer is walks— lots of them. 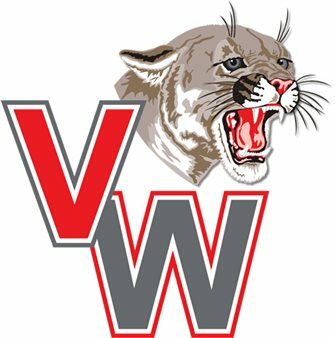 Van Wert was awarded first base 13 times in their WBL match up against the Titans, as the Cougs run ruled O-G 15-0 in five innings. MIDDLE POINT — The Lancers continue their firm dominance over the NWC as Gavin Carter hurled a no-hitter and the offense knocked 18 hits. 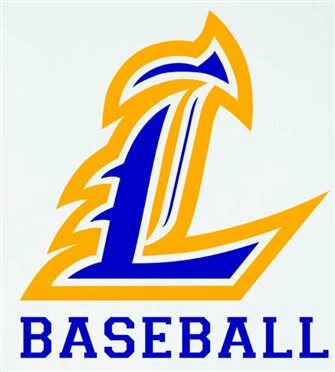 Lincolnview run-ruled Bluffton in six innings, 10-0. 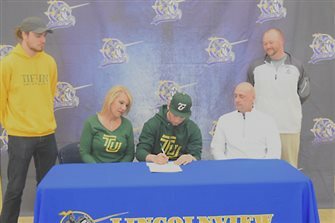 MIDDLE POINT — Lincolnview standout, Jaden Youtsey has signed a letter of intent to play baseball at Tiffin University. MIDDLE POINT — Senior Lakin Brant signs her letter of intent to Boyce College to continue her volleyball career.Boyce College is a private, Christian college affiliated with the Southern Baptist Convention and located in the Crescent Hill neighborhood of Louisville, Kentucky. ROCKFORD — The Lady Panthers fell for the first time this season, just a day after they were voted number one in the state by the OHSFSCA. After falling behind 7-2 early in the game, the Lady tied the game up over the next two innings. New Bremen scored three runs in the top of the eighth inning, to beat Parkway. The Lady Panthers stranded 10 runners on Tuesday. ROCKFORD — The Panthers finally got off of their skid Monday night as they imposed their will on the State Runners-Up from last season, Wapakoneta. Parkway got a great starting pitching performance from Justin Felver, as the Panthers beat Wapak 8-1. 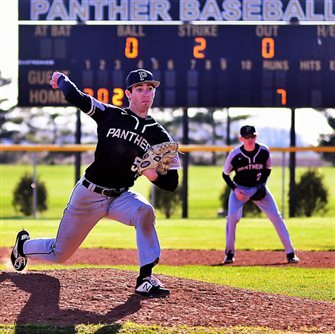 EDGERTON - Wayne Trace senior pitcher Braden Zuber set a new school record for career strikeouts with a 15-strikeout performance to lead the Raiders to a 5-1 win at Edgerton Tuesday night in Green Meadows Conference action. 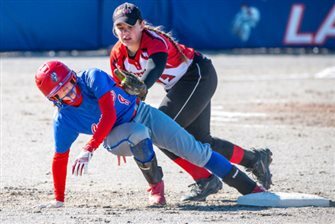 CONVOY — Monday’s softball game could hardly have gone better for Crestview as the Lady Knights run-ruled Delphos Jefferson 10-0. Crestview is now 10-3 overall and 3-1 in the NWC. Jefferson is 5-10 and 1-2. 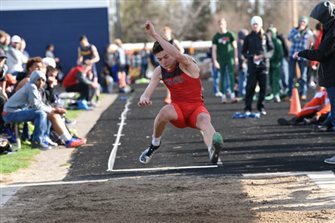 HICKSVILLE — Crestview track and field teams competed at Hicksville , with Antwerp and Continental on Monday, April 15, 2019. The boys team (15-23) finished in second place and the girls team (4-32) team finished in third place on the evening. Both teams return to action on Thursday, April 18th at Fort Recovery. 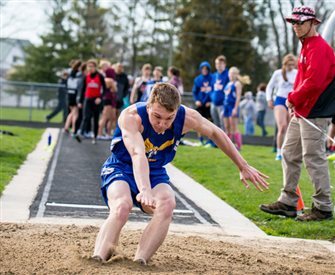 COLUMBUS GROVE — Lincolnview track and field team competed at the Columbus Grove invitational on Friday night. The boys outlasted host Columbus Grove and Division II Anna to take home the championship trophy scoring 130 points. The boys were able to place in 15 of the 17 events and were able to take two places in seven of the events. The boys season record is now 17-0. The girls had a solid fifth place finish, just a few points behind 4th place. The girls placed in eight of the 17 events. The girls season record is now 13-4. TOLEDO — Venues in sports is often the vessel that drives the memories. For instance, there is a reason that every rookie NBA player that plays against the Knicks is asked what it feels like to compete in Madison Square Garden. Or, even better, there is a reason Eggerss Stadium is still the home of the Cougars every fall— the venue matters. 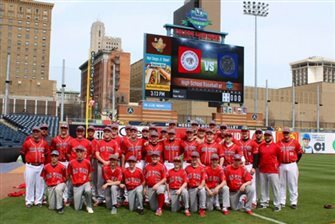 Luckily, Van Wert was able to play on the professional ball field of the Toledo Mud Hens on Saturday. The Cougars even shut out the Edon Bombers 7-0, as they walked away from Fifth - Third field all smiles. 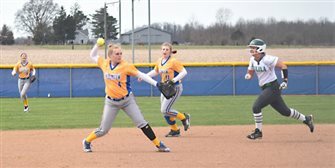 OTTAWA - The Wayne Trace Lady Raiders hit the road on Saturday to Putnam County and came home with a pair of victories over host Ottawa Glandorf in high school softball action. VAN WERT — The Van Wert County Foundation Tennis Complex hosted the first Van Wert Invitational Saturday with Ottawa-Glandorf narrowly winning the four-team affair 17-16 over the Cougars.